Sword will have a black handle. 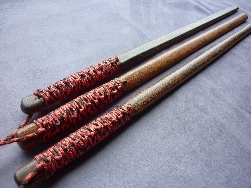 Made from Carabao (Buffalo) Horn, these palm sticks are the FMA's answer to personal protection This is the personal self protection tool that has been used for generations in the Philippines. Hand crafted in the Philippines and polished to a fine finish. Length approx 17 cm. Made from natural material, size and shape may vary.